The Paris Peace Conference began on January 18, 1919, which was the forty-eighth anniversary of the coronation of Wilhelm I after the Franco-Prussian War, wherein the new Germany seized Alsace and Lorraine from France. Additionally, Wilhelm’s coronation was held at the Palace of Versailles, a fact not overlooked when the allied delegation determined the location for the signing of the 1919 treaty. The dates and locations selected by the victors of the Great War glaringly support the premise of vengeance. From the preface until the last chapter, Neiberg enforces the idea of retribution on the part of the Allies, specifically France and Great Britain, of equal importance, however; is the reinforcement of the idea that history cannot escape itself. The Paris Peace Conference was, in part, an event by which France punished Germany for past actions. Further, the terms of the Treaty of Versailles were concerned more with future political power struggles than with ending the First World War. French Marshal Ferdinand Foch, who was the Allied Supreme Commander, believed that the decision when to end the war and agree to an armistice was the duty of a soldier, not a politician. In turn, French Prime Minister Georges Clemenceau held that treaty making was a job for politicians and banned Foch from the peace conference. The other delegates followed suit and no military personnel were present to consult on terms of the treaty. Germany was also excluded as were delegates from Russia, a country consumed by their own civil war at the time. The expansion of Bolshevism was an ongoing concern to the delegates during the conference, especially when deciding on the new borders to be drawn in Europe. Additionally, four major countries (Austria-Hungary, Germany, Ottoman Empire, Russia) were without stable governments at the time of the conference and the delegates concerned themselves with filling those voids with regimes suited to their own individual ideals. While the politicians pursued their own agendas, the ignored military and economic experts were left with a sense of incredulous frustration. France’s Clemenceau, David Lloyd George of Great Britain, and American President Woodrow Wilson, known collectively as The Big Three, held the most power during the conference. France wanted protection and territory in Europe, Britain was concerned with imperialistic endeavors in Africa and the Pacific, while Wilson promoted his idealistic Fourteen Points and the League of Nations. The U.S. President was not only uninformed on international matters, he was also arrogant and unyielding, thus making him a poor negotiator on what was chiefly a European matter. Asian and African nations also had interests in the War and conference, however; the ubiquitous racism of the period left non-white countries with little or no positive results. Land was divided between China and Japan that empowered the Japanese greatly, however; the refusal on the part of the Big Three to include the Japanese proposed equality clause in the treaty left that nation powerful and angry. An angry Japan in 1919 was of little significance to Clemenceau, George, and Wilson, however; this seemingly insignificant fact furthers the position of vengeance and events being interwoven throughout history. 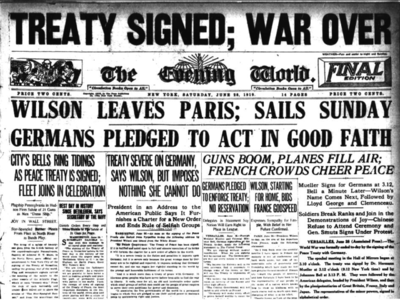 Neiberg’s does an excellent job of not only covering what clauses the treaty included, but more importantly discusses why they were written and how they affected Germany. The importance of this cannot be overlooked. When it appeared as though Germany would lose the war, General Erich Ludendorff, on October 26, 1918, fled to Sweden and began to perpetuate the “Stab-in-the-Back” myth. He advanced the idea that Germany did not lose the war militarily on the battlefield, rather; the German people were betrayed by a weak government. This so-called myth was reinforced by the Treaty of Versailles, particularly by the War Guilt Clause, which stated that Germany was responsible for starting the war and would thereby be held accountable financially. Economic experts protested the reparations imposed on Germany as too severe and potentially catastrophic to the world economy. These protestations were ignored. Germany emerged from the conference hungry, angry, financially destroyed, and seeking vengeance. As we now know, both Germany and Japan avenged their countries a mere two decades after the treaty was signed. At the conclusion of World War II, when the second version of The Big Three met at the Potsdam Conference in 1945, they unanimously agreed to avoid repeating the actions taken in Paris and Versailles. That speaks to the perception of the Treaty of Versailles as a failure. This book does not argue for or against that position, rather the author skillfully navigates through the organized chaos of the Paris Peace Conference in such a manner that the reader is armed with enough sound facts to reach a conclusion. This is an excellent text for students studying the interwar years. 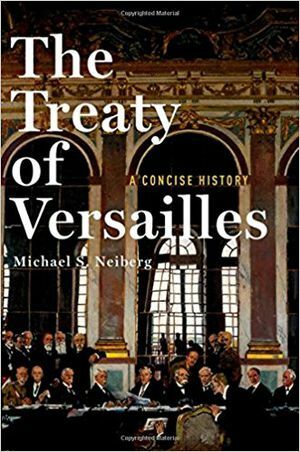 The Treaty of Versailles must be understood by those who study World War II and Michael S. Neiberg’s book is an excellent tool for teachers and a necessary resource for students. This page was last edited on 10 November 2018, at 20:39.